At TAP Canada, we believe in good sportsmanship above all else. 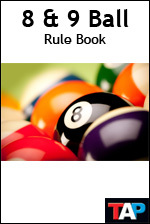 Our Rules and General Guidelines booklet for 8-ball and 9-ball has been written from the view that the best games are the ones won on skill, not technicalities. Our rules are clear, fair and easily relatable. Measuring 4-1/2" wide, the booklet is easily stored in your cue case. It is a good idea to carry a copy with you, especially at higher levels tournaments. Referees at such tournaments will carry them for your reference, if needed. You can print the rule book by clicking on the image to the left, or the link below. Click here for complete TAP 8 and 9 ball rules of play.